It would be a complete understatement if I said my kids didn't like helping me in the kitchen. It has gotten to the point where I hardly get to do anything and they start fighting over who gets to stir or add this ingredient or whatever. I love having them help and love the fact that they are so interested in cooking/baking. On a Friday night, a couple of weeks ago, my 5 year old daughter told me she wanted to make dinner. I got out some veggies and we started discussing the options. This frittata is what we ended up with. I kid you not when I say that my 5 year old made this dinner almost without any help. She chopped (with me holding the knife with her) sauteed (I watched), whisked the eggs, measured, layered, etc. She really did all the work and she was so proud and excited to eat what she had made. The great thing about this meal is that you will end up with roasted veggies and cooked sausage/onion mixture, which will give you a head start on dinner for a couple of extra nights. 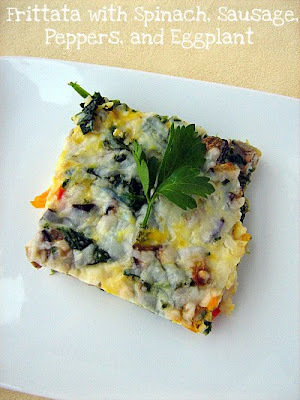 Another thing about this frittata is that you can mix and match the veggies and protein to whatever you have on hand at the time. You could roast mushrooms or zucchini or whatever you have on hand. You could use chicken, ground turkey/beef, tofu, or any other protein in place of the turkey sausage. You could use thyme or rosemary instead of the chives. You could also add cottage cheese or feta to the egg mixture. Be adventurous and mix it up! We have started having a frittata once a week using whatever veggies are in the fridge. I love having the leftover pieces for breakfast later in the week. The best part about having kids help in the kitchen is that they really want to eat what they create. I did not have to bribe or plead with my kids to eat this. My daughter was so happy that she made it, she gobbled it up and her siblings were so proud they gobbled too. Not to mention, it was really delicious. Place chopped peppers and eggplant on a baking sheet. Drizzle with 1 Tbls olive oil. Season with salt and pepper. Roast for 15 minutes. Set aside. Reduce oven temperature to 400 degrees. Heat 1 Tbls olive oil in a large skillet. Add chopped onion and saute for a few minutes. Add sausage and break up into small pieces. Add garlic and cook until sausage is cooked through, 6-9 minutes. Place half of sausage/onion mixture in another container and refrigerate for another use. Add baby spinach to sausage/onion mixture left in skillet, and saute, until wilted. Set aside. In a large bowl, crack 10 eggs. Whisk to combine. Add chopped chives and milk. Season with salt and pepper, and whisk until combined. Spray a 9x13-inch pyrex dish with cooking spray. Spread the sausage/spinach mixture on the bottom of the dish. Add half of the roasted peppers and eggplant (put the other 1/2 of veggies in a plastic container and refrigerate for another day). Pour the egg mixture over the sausage/veggies and make sure all veggies are covered with the eggs. Sprinkle the shredded mozzarella cheese over the top. Bake in the 400 degree oven for 20-23 minutes. It is a delicate little green that has a big bite. It is often described as "peppery" and as having a "strong" flavor. It definitely has some taste to it and I think it is wonderful. I love using arugula in salads, on sandwiches, pizza, basically anywhere you would use spinach. I had a couple cups left in my fridge a couple of weeks ago and decided I wanted to make pesto with it. 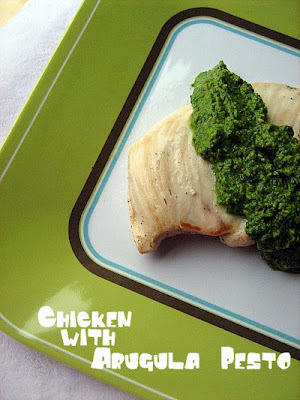 I found this recipe for Chicken with Arugula Pesto on epicurious.com and thought chicken would be great with the pesto. Some of the recipe reviews said that they subbed in a cup or so of spinach in the pesto to tone down the arugula and I am sure that was a tasty substitution. 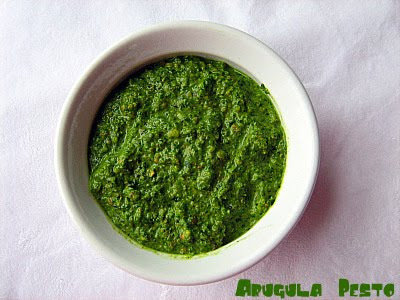 The leftover pesto is great spread on sandwiches, wraps, as a base sauce for pizza or even with pasta. The recipe called for poached chicken, but seared both sides of my chicken before I added the broth to the pan, so that the chicken would have a better texture on the exterior. I should have sliced the chicken for the picture, it would have looked better, but thought of that after the fact. Oh well! It was yummy! So, apparently, yesterday was National Pancake Day. How do these things go by without me knowing about them? I don't know. Oh, well. We actually had these pancakes a couple of weeks ago. The recipe stuck out to me, when I was flipping through a copy of Cooking Light and I really loved the whole idea of these pancakes. Anytime you can get vegetables in, the recipe has the word cake in it, and it is considered breakfast food- you can bet I will give it a try. My family wasn't so sure though. They had me whip up a batch of Buttermilk Pancakes too, just in case they didn't like the Carrot Cake ones. I didn't care, because if they didn't like them, that just meant there would be more leftovers for me to enjoy on another day. This recipe was a even split. Half of my family liked it and half of them didn't. Everyone still ate at least one, but a few family members didn't appreciate all the "stuff" they had packed inside. I don't mind pancakes with "stuff", so I just put the leftover pancakes in a baggie, placed them in the freezer and we warmed them in the toaster later that week. I don't want you to think that these are light and fluffy pancakes. They aren't. But, keep in mind they aren't meant to be light and fluffy. 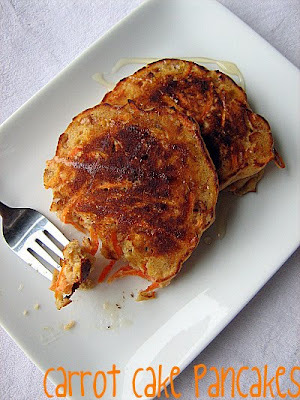 They have a similar texture to actual carrot cake, which is usually more dense than light. I used pecans instead of walnuts and I didn't make the honey butter. We just drizzled these with honey. 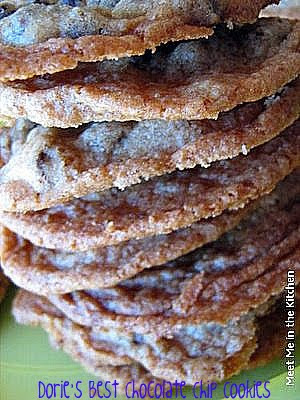 The great thing about these pancakes is that they are tasty enough to be eaten without any syrup or honey, which makes for a quick breakfast on the go or snack, if you make them and freeze some for later. Okay, this is soo easy, it almost seems ridiculous to post about. 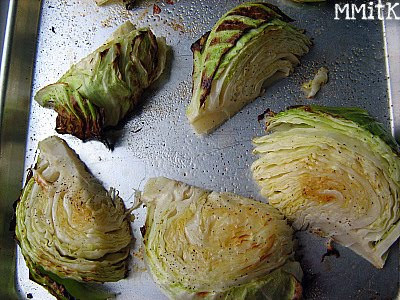 But, I never would have thought to roast green cabbage on my own, so when I flipped through the January issue of Martha Stewart Living and saw these gorgeous pieces of cabbage that had browned edges, I couldn't believe it. This has got to be one of the simpliest recipes ever. Cut a cabbage into wedges. Brush the wedges with olive oil. Season with salt and pepper. Roast in the oven, turning halfway through. Eat. I mean, it really is just that simple. My kids and I went crazy for this. We were all eating it with our fingers, holding the little piece of core and just gobbling it down. The outside leaves were a little bit crunchy, but the inside was so tender, it basically just melted in your mouth. It was really unbelievable how delicious this cabbage was. Just be sure to leave the core intact when you are cutting your cabbage into wedges, so that your cabbage leaves don't fall off all over the place. This is one that we are going to enjoy over and over again. Arrange cabbage on a rimmed baking sheet. Brush both sides of wedges with oil. Season with salt and pepper. Roast, flipping half-way through, until edges are brown and crisp, 25 to 30 minutes. 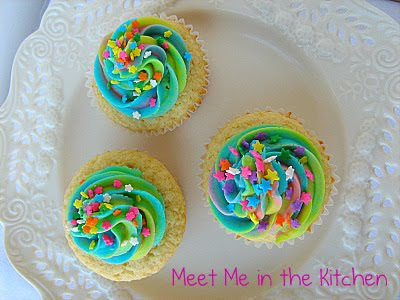 Happy Blogiversary to Meet Me in the Kitchen! 2 years ago I started this blog as a way to share great recipes. It has been a really fun way to share what I love and a great outlet for me. Now about these festive cupcakes, with a little detour about cookies first. A little over a month ago my girls wanted to decorate cookies. I wanted to use up 2 egg yolks that I had hanging out in my fridge. I remembered that Dorie's Sugar Cookie recipe called for an extra yolk and I also knew that it was a wonderful recipe (I have made it multiple times), so I mixed up a double batch. I put half the dough in the freezer ( We used it for Valentines Day cookies) and the other half in the fridge to rest overnight. Too bad I did this on a Friday night and promised my kids we would cut the cookies out in the morning. They woke up super early!! It was really fun cutting out millions of shapes with them. We made a big batch of frosting and made 3 colors- Neon pink, blue and greenish/yellow. Well, we had leftover frosting and my daughter wanted to make cupcakes for her Sunday School teacher. 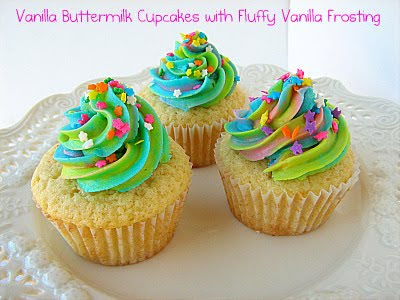 So, we threw together these Vanilla Buttermilk Cupcakes and used the leftover frosting. My daughter was proud of the frosting and sprinkles, so I am sharing the recipe again. You can go to this older post to see how we enjoyed these cupcakes last time! In a separate bowl, combine flour, sugar, baking powder, baking soda, and salt. Whisk together and add to buttermilk mixture. Whisk until smooth. Fill muffin cups about 1/2 full and bake for 15-18 minutes. Let cool for 10 minutes on rack. Remove from rack and let cool completely. I have mentioned how much I love The Vegetable Dishes I Can't Live Without by Mollie Katzen. It is just a never ending supply of great ways to try vegetables. I had some parsnips and I was flipping through this book to find a new way to eat them. 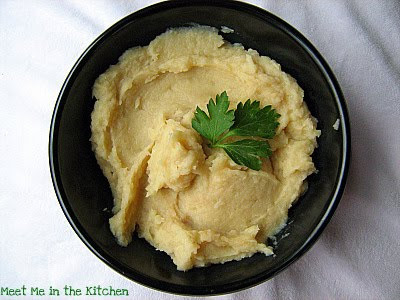 I decided on the recipe for Mashed Parsnips because it completely transforms the parsnips into a smooth puree which is a way that I have never experienced them. Parsnips have a sweetness to them but also an interesting little bite. I can't really describe it. The balsamic vinegar in this recipe really plays well with the sweetness of the parsnips. It cuts it and also just really makes them taste delicious. This kind of reminded me of sweet potatoes, but not completely. It just is really hard to describe for some reason! Here is what Mollie has to say about them- " Parsnips are out there, just waiting for you to discover them. Here's a good way to do that. I guarantee that you will be Quite Surprised by their subtle sweetness." This is a side dish that can be made in less than 30 minutes and really just has a few steps, so it is quick and easy. This week's TWD recipe was chosen by Kait, who blogs over at Kait's Plate. You should be able to find the recipe on her blog. If not, you can find the recipe HERE, from my post about these cookies over a year ago. I didn't make them again b/c I didn't really care for them and actually ended up churning the leftover cookie dough that I didn't bake into vanilla ice cream, for homemade CCC dough ice cream. I am pretty sure I did something wrong when I made these, because my cookies did not look anything like the ones in the book. They were very thin and crispy. Go and see what the other TWD group members thought about these cookies by checking out the TWD Blogroll! 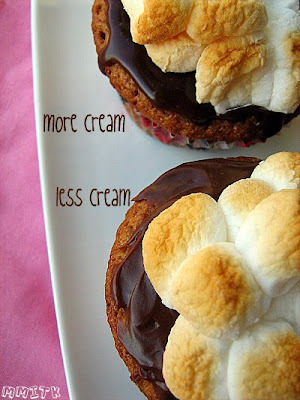 This month's MSC cupcake choice- S'mores Cupcakes, was chosen by yours truly. It isn't as easy to choose an item to bake for a group like this as it may seem. I debated for awhile. I really wanted to choose the Rhubarb Cupcakes with Whipped Cream (pg 33), but I haven't seen any fresh rhubarb yet this season and some fruit choices cause more debate than other things. The Bluberries-and-Cream Cupcakes (pg 42) also looked really good and the Iced Pistachio Cupcakes (pg68) made their way into my choice list too. There were others, but in the end, it all came down to the 1 cupcake that caught my eye the first time I flipped through this book. I have this thing with graham crackers, which I have mentioned before, which is- I cannot have them in my house because I will eat them all. I never buy them, unless I know that I am going to be using all of them in a recipe, or if I am willing to sacrifice an entire meals calorie allotment on a package of graham crackers, dipped in milk. I know I have a problem and therefore I avoid the item which causes a complete lack of self-control. I was curious about a cupcake that actually tastes like a S'more. The marshmallow frosting looked billowy and yummy and so, this is my pick. I made them yesterday for our Valentine's Day dessert. I skipped the frosting called for, simply because it said that it would harden if not used/served immediately and I knew I had to make and assemble these a few hours before we would eat them. I also made a ganache with milk chocolate, to keep the flavors true to an actual S'more and used chocolate chips, instead of chopped chocolate and cream. No corn syrup. On the first try, the ganache was too thin, so I tried again with less cream, until the consistency was spreadable. 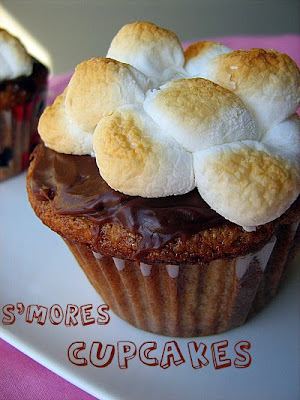 I also used the marshmallow topping that we used for the Sweet Potato Cupcakes a couple of months ago, which is simply broiling little piles of mini marshmallows and transferring them to the top of the cupcakes. I made half the recipe and ended up with 9 cupcakes and 15 mini cupcakes. Please ignore the Halloween cupcake liners- I ran out of plain ones and didn't know it until it was too late. My 3 yr old and I tasted the cupcakes without the chocolate and marshmallows and they were really good. I am definitely going to make these again when I can serve them immediately and try out the frosting called for. I took them to a family dinner and everyone enjoyed them. I thought that they really tasted like a s'more, which is the whole point. I was pleasantly surprised. Go to the MSC Blogroll to see everyone else's thoughts on these! I haven't felt compelled to compare recipes for a dessert for a long time. 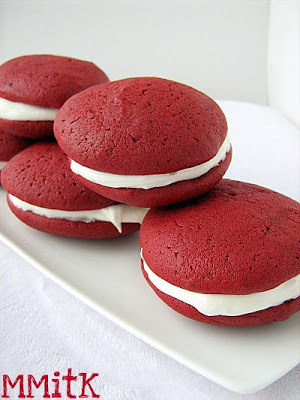 After I made those red velvet cupcakes last month, I couldn't help wanting to make these Red Velvet Whoopie Pies that I saw in the Food Network Magazine. 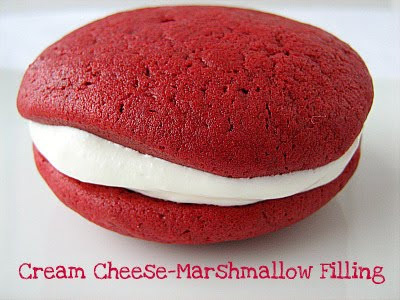 I remembered seeing other recipes for Red Velvet Whoopie Pies and decided it was time for a taste test. Luckily, we had another family dinner that I was bringing dessert to, so I had enough people to actually taste these little guys. 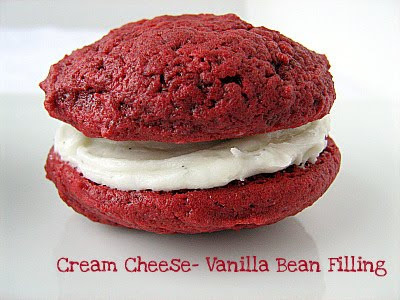 There were more than 2 recipes that I found for Red Velvet Whoopie Pies, but these 2 were the ones that had me most interested. 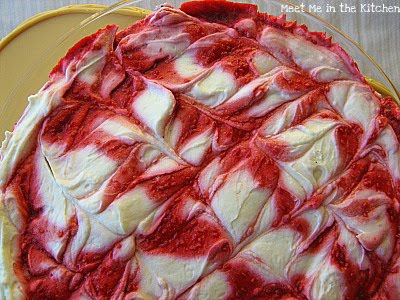 I liked that the Food Network's recipe actually had vinegar in it, since I think that is one of the key components in red velvet cake. The Cream Cheese-Vanilla Bean filling/frosting was definitely the favorite of the frostings. And these Whoopie Pies turned out to be the winners in the flavor department. They may not have been the prettiest of the Pies, but the cake was moist and tender and had the perfect flavor, as well as texture. The Cream Cheese-Marshmallow Creme filling/frosting was not as popular. There were a few people who preferred this filling, but the overall consensus was that the other filling tasted better. These BH&G cakes looked better, but didn't taste as good. Don't get me wrong- they were still yummy, but when compared head on to the Food Network's version, they were not as tasty. So, which ones will you make for your Valentine's Day treat?? 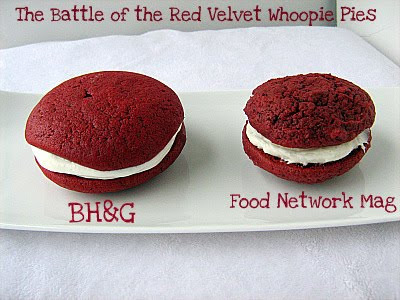 Or, do you want to make both and come to your own conclusion about which ones deserve the title of Best Red Velvet Whoopie Pie? Here is another option for Valentine's Day. This is a light and fruity dessert. We have been eating tons of grapefruit this winter. They are in season and fairly cheap. My girls and I like to eat them for breakfast and my 5 year old is convinced that if we plant the grapefruit seeds, we will soon have our own grapefruit tree. I was looking through one of my 3 ring binders that is full of recipes which I have torn out of magazines and I noticed this recipe. 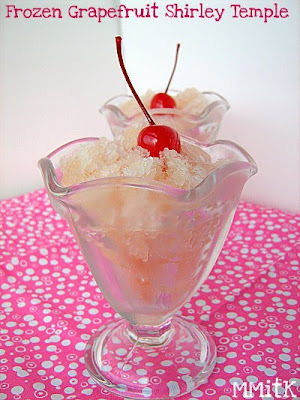 I just happen to have some ginger ale in the pantry, as well as maraschino cherries. I bought both of them months ago, for some sort of drink that never happened. I also had some V8 Fusion juice in the fridge, so I had everything I needed to throw this recipe together. All you have to do is stir the 4 ingredients together, then freeze them in a metal pan, scraping them with a fork a couple of times. When you are ready to serve, put a little cherry on top and you are ready to go. 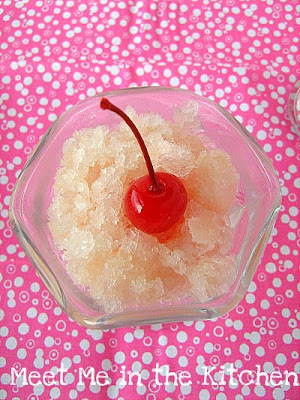 This little treat can be so fun for kids and adults. You can serve it in a pretty little glass cup and everyone will feel festive. Not to mention how delicious it is. It is a sweet treat, but you don't have to feel guilty about eating this one. No fat involved. Sure there is plenty of sugar, but hopefully the freshly squeezed grapefruit juice makes it a little bit better for you then a cookie or something. We really loved this one. I used V8 V-Fusion Goji Raspberry Juice, because I had it in my fridge. So what are you serving for Valentine's Day dessert? This simple cheesecake is a great option. My daughter was looking through Annabel Karmel's Mom and Me Cookbook and when she got to this recipe she asked me if I could make it. We were going to be eating dinner at my mother in-law's the next night and I was bringing dessert, so I changed my plans and decided to make this no-bake cheesecake. This recipe is soo easy. There is no baking involved. Your kids can help you mix it up. You just need to plan to make it ahead of time so it can chill for the required amount of hours. I let mine chill overnight. I apologize for the pictures, but I was hurrying out the door to go to dinner and didn't have time to cut a slice and make it look nice. Anyway, this cheesecake was a huge hit with everyone. It is basically just cream cheese and whipped cream folded together and then chilled, with a lovely raspberry sauce swirled through and a graham cracker crust. This cheesecake tastes really light and luscious. It has a great texture. The adults loved it and the kids loved it too. My sister in-law even asked me for the recipe that night and has already made it herself. Plus, it is has red in it-so it is perfect for Valentine's Day! 1. Put the graham crackers in a bag. Use a rolling pin to roll and crush them into crumbs. 2. Melt the butter in a pan. Pour the crushed graham crackers into the butter and stir thoroughly. 3. Line an 8-inch springform pan with plastic wrap. Spoon in the cracker mixture, press flat and refrigerate. 4. Make raspberry puree- bring the raspberries and powdered sugar to a boil, then simmer for 10 minutes. Cool, then press through a sieve. 5. Mix together the cream cheese, superfine sugar, and vanilla extract. Whip the cream until stiff, then fold it into the cheese mixture. 6. Spread 3/4 of the cheese topping on the graham cracker base. 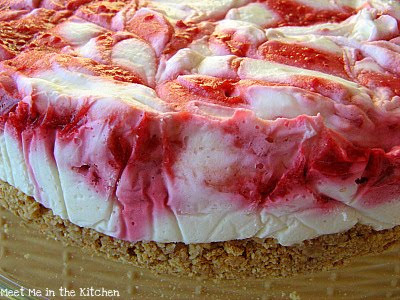 Then spoon on 3/4 of the puree and swirl it into the cheesecake mixture. 7. Gently spread on the remaining cheesecake mixture. Drizzle on straight lines of raspberry puree. Pull a skewer across the lines for a decorative effect. 8. Leave the cheesecake in the refrigerator for at least 2 hours of overnight. 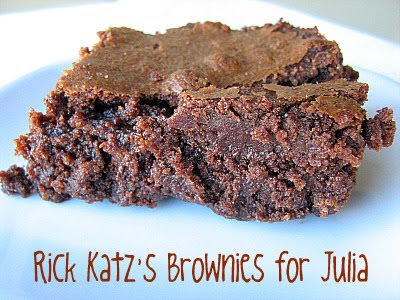 This week's Tuesdays with Dorie recipe, Rick Katz's Brownies for Julia, was chosen by Chocolatechic. You can find the recipe on her blog. I know I am the strangest person on the planet, but believe me when I say- Brownies do absolutely nothing for me. I hardly ever make them just because I don't crave them. They are my son's fave dessert, but I don't make them very often. I thought about skipping this recipe. Then I just decided to make them and give them away. 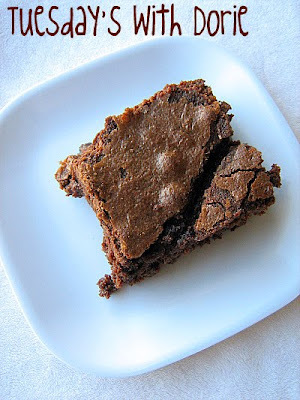 These brownies are unique because half of the egg/sugar mixture is just mixed into the batter and the other half of the egg/sugar mixture is whipped which results in a fudgy, smooth brownie. I had to bake mine for 15 minutes more than the recipe called for because they were still liquid in the middle. I let them set in the fridge overnight so I could cut them (they were still quite gooey) and that morning I sent them with my husband to work. If you are a brownie lover, I suggest you try these, although I am sorry I can't comment on if they were great or not. My hubby brought home an empty container from work, so obviously someone liked them! Go check out everyone else's results, by browsing through the TWD Blogroll!! We go through banana stages. Sometimes we eat them like crazy and everyone is begging for more once they are gone and sometimes, they just sit there. And turn yucky colors; begging to be turned into something much more delicious than just a plain old banana. I think I have tried every Cooking Light recipe for Banana Bread that they have ever invented or published. Such as Coconut Banana Bread with Lime Glaze (my personal fave), Bluberry-Lemon Banana Bread with Cream Cheese Glaze, Marbled-Chocolate Banana Bread, Molasses-Oat Banana Bread, Cardamom Banana Bread with Pistachios, Orange-Banana Nut Bread, etc. I think you get the idea. I have also made their Classic Banana Bread before, which is the recipe I used for these muffins. 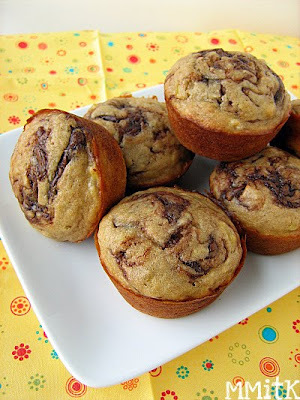 I saw a post over on Barbara's blog, Barbara Bakes where she swirled Nutella into the banana bread batter and I knew I would have to do that too. Some people debate the combination of bananas and chocolate, but not in this house. These were the perfect afternoon snack and we also took some to a friends house to share. 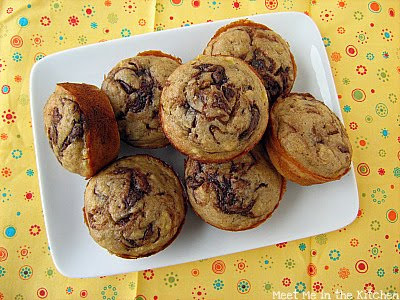 I used half whole wheat flour, swirled about 3/4 tsp of nutella into the top of each muffin. Baked them for 18 minutes and they were done. It seems like it will never stop raining around here. I am not going to complain about the weather, but somehow it really affects my mood more than I would like it too. When I wake up to gray skies and rainfall, I want to snuggle back into my covers and stay there for the entire day. At this point in my life, staying in bed all day is not an option. That little blurb has absolutely nothing to do with this salmon- I just had to share. I can't remember exactly where I saw this recipe, I think it was in a Cooking Light magazine or cookbook or something. 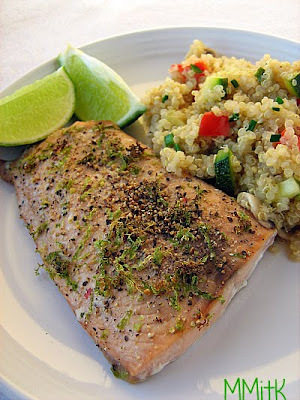 The combination of the pepper and lime sounded really good to me and I liked the fact that the side dish was a quinoa-veggie combination. This quick rub comes together is seconds and it is a simple flavor combination. Sometimes those simple things have the best results. I am lucky because my kids really love to eat fish. I have been trying to serve it at least twice a week and it is really helpful that I don't get any complaints when I serve fish for dinner. This was a really great, quick dinner. My family loves quinoa too, so there were no fights about that either. I love having sucessful dinner experiences. 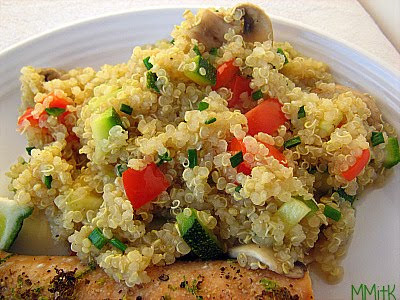 For Quinoa-Vegetable Salad- combine 1 1/4 cups chicken broth and 3/4 cup uncooked quinoa in a medium saucepan; bring mixture to a boil. Cover and simmer 12 minutes or until liquid is almost absorbed. Stir in 1 1/2 cups chopped zucchini and 1/2 cup chopped red bell pepper. (I also added 1 cup sliced mushrooms). Cover and cook 5 minutes or until liquid is absorbed. Stir in 2 Tbls chopped fresh chives, 2 tsps olive oil, 1/4 tsp each salt and pepper. This week's CEiMB recipe, Curried Chicken Salad, was chosen by Sarah, who blogs over at Sarah's Kitchen Adventures. You can find the recipe on her blog or by clicking HERE. This will be the last time that I am participating in CEiMB and what a great recipe to go out on. I made a few changes, which I noted on the recipe below. I love curry powder, so I was pretty sure that I would like this take on chicken salad. My mom makes a chicken dish that combines plain yogurt and curry powder, so the flavor wasn't really anything new to me. Of course, I did not use mayo at all. Don't like it and never will. I just subbed non-fat Greek yogurt. I also subbed in pecans for the almonds, because I had them on hand. I just mixed them into the salad. I love that Ellie serves this over lots of fresh salad greens. I didn't use any oil to dress my greens, just the fresh lemon juice which really gave this salad a bright taste. I even served the leftovers in my husband's lunch, but turned it into a chicken salad sandwich. My kids enjoyed this tucked into mini whole wheat pitas. Check out the CEiMB Blogroll to see what everyone else thought about this Curried Chicken Salad! 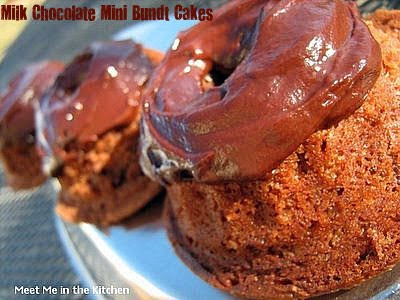 This week's Tuesday's with Dorie recipe, Milk Chocolate Mini Bundt Cakes, was chosen by Kristin. You can find the recipe on her blog, I'm Right About Everything or HERE from my post about these mini bundts when I made them a little over a year ago. I made mini, mini bundts. Meaning I used one of those pans that has 12 mini bundt molds. I remember these being very good. A couple of them crumbled a little bit, from the nutty-sugar swirl that is in the middle, but I remember that we ate the crumbs of the crumbly ones anyway. I had a problem with the glaze, but it sounded like many people had the same problem. Mine wasn't pourable at all. Someone mentioned there might have been a little bit too much corn syrup in the glaze. Go check out the TWD Blogroll to see who else enjoyed these little bundt cakes!